HRUS is cheap yet sensitive modality for MSK cases and needs sensitization for its optimal utilization. Department of Radiodiagnosis, Sarojini Medical College, Agra. India. Department of radiodiagnosis, UPRIMS&R, Saifai. India. 310, Shivam Elegant Apartment, Sikandra Bodla Road, Agra 282007. India. Introduction: Benign musculoskeletal lipomatous lesions are common in both soft tissue and bone. Imaging features of benign lipomatous lesions are often pathognomonic. Ultrasound (US) has been used to examine both soft tissue and bone tumors, allowing targeted CT or MRI examination of the region of interest. 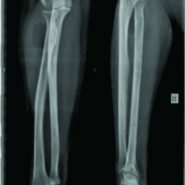 Case Report: A 46-year-old female presented with a four year history of palpable mass lesion just below the lateral aspect of right elbow with clinical evidence of posterior interosseous nerve compression. X-ray showed the presence of a radiolucency mass in relation to radius. HRUS demonstrated a hyperechoic mass in soft tissue with a focal irregularity in bony cortex of radius. The mass lesion compressed the posterior interosseous nerve. Conclusion: Although CT and MRI diagnose them accurately, but ultrasound characteristics are also conclusive for extra osseous component. This case highlights the importance of HRUS for evaluation of musculoskeletal tumors and any secondary changes in a readily available cost effective dynamic modality and thus guide for treatment planning accordingly. Benign musculoskeletal lipomatous lesions are common in both soft tissue and bone. Lipomas are common benign soft tissue tumors, which can be subcutaneous, intramuscular, or intermuscular. Osseous lipomas are classified by the site of origin: either within bone (intraosseous lipoma) or on the surface of bone (juxtacortical). Intraosseous lipomas include intramedullary and intracortical lesions. Imaging features of benign lipomatous lesions are often pathognomonic. They are hypovascular, predominantly homogeneous and often hyper- or isoechoic to the surrounding fat. Ultrasound (US) has been used to examine both soft tissue and bone tumors but magnetic resonance imaging (MRI) and computed tomography (CT) provide more information about the extent of tumor involvement. The diagnosis is best established by density measurements on CT. US examines a lesion along its entire length in a few minutes, allowing targeted CT or MRI examination of the region of interest. Also, it can clearly demonstrate the relationship of a mass to adjacent nerves, vessels and bone. 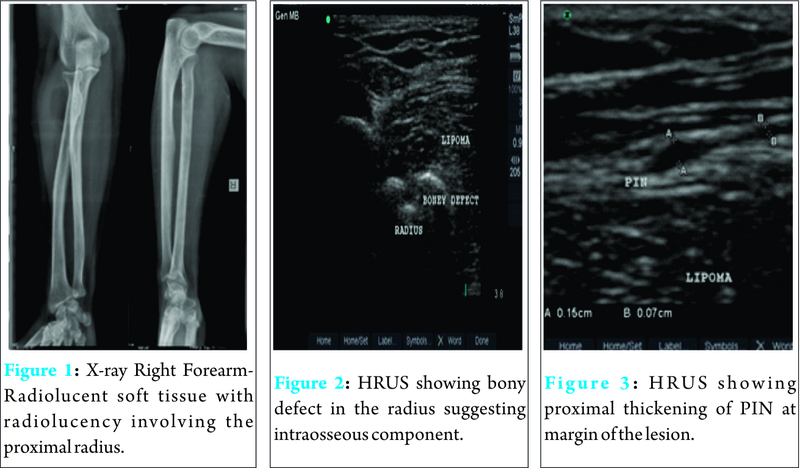 We describe an unusual case of a solitary intraosseous lipoma of the proximal radius with extra osseous tumor extension and a secondary posterior interosseous nerve compression, findings well documented on HRUS and X-ray. A 46-year-old female presented with a four year history of palpable mass lesion just below the lateral aspect of right elbow which did not cause any discomfort. For last 6 months, she noticed increase in size with an intolerable pain in the forearm. The patient had previously been in good health and was without major systemic disease. Physical examination showed a right elbow mass, which was soft in consistency and associated with some local tenderness. There was clinical evidence of posterior interosseous nerve compression. Laboratory studies, including complete blood cell counts, blood and biochemistry urinalysis, were all within normal limits. Conventional radiographs of the left elbow with forearm in anteroposterior and lateral views showed the presence of a soft tissue mass with increased radiolucency in relation to radius (Fig. 1). 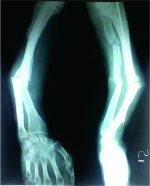 Bony radiolucency involving the proximal end of the radius was noted. Increased density and cortical thickening were noted around the proximal end of the radius. These findings were suggestive of intraosseous lipoma with extra osseous extension, and the differential diagnosis was intramuscular or parosteal lipoma with adjacent bone extension. HRUS was performed to determine the relationship between the lesion and the surrounding structures. It demonstrated a hyperechoic mass lesion (3.8 x 2.0 cm in size) in soft tissue in radial aspect with a focal irregularity in bony cortex of radius bone (Fig. 2).There were some echogenic streaks in the mass, suggesting a lipomatous tumor. This mass lesion compressed the posterior interosseous nerve (Fig. 3) in proximal forearm between two heads of supinator muscle (Arcade of Frohse). The US diagnosis was lipomatous tumor, such as lipoma or low-grade liposarcoma with bony involvement and secondary compression of posterior interosseous nerve. Deep-seated lipomas are rare neoplasms. Previous articles have described intraosseous lipomas [2-6], but there have been only a few case reports on intraosseous lipoma with extra osseous extension and these rarely emphasized the US findings [1-8]. Lipomas of the subcutaneous tissues may appear hyperechoic (29%), hypoechoic (29%) and isoechoic (22%) or can be of mixed echogenicity (20%). They are always soft, pliable masses, and typically have an elongated shape and an orientation parallel to the skin. Their echogenicity depends on the proportion of fat and water content in the lipoma. US is the first modality for imaging of the swelling to evaluate nature of the mass and further imaging. Further, it can guide for next imaging and also can evaluate mass lesion in dynamic state to rule any underlying mass effect on adjacent structures. With its limitation to bony cortex and bone marrow studies, it can well evaluate adjacent mass lesion. Palsy of the PIN in the absence of trauma is an uncommon clinical entity. Compression of the PIN, secondary to a lipoma comprises a minute fraction of the latter. Patients with posterior interosseous nerve syndrome report hand weakness, whereas those with radial tunnel syndrome report pain in the lateral elbow and forearm, which may be confused with lateral epicondylitis. Distal to its origin, the posterior interosseous nerve is susceptible to compression at several levels. The first is as it passes the level of the radial head to travel beneath the fibrous bands that are confluent with brachialis, brachioradialis, extensor carpi radialis brevis, and the superficial head of supinator. The second is at the level of the radial neck where the posterior interosseous nerve is crossed by radial recurrent vessels. The next potential point of compression is beneath the tendinous margin of extensor carpi radialis brevis. The fourth and most common point of compression is as the nerve passes beneath the free aponeurotic margin of supinator. The Arcade of Frohse is a connection between the deep and superficial heads of supinator and is fibrotendinous of the population. The final potential site of compression is over the distal edge of supinator . Elbow ultrasound is a diagnostic technique that in expert hands allows the diagnosis of many diseases and can avoid the use of other less available techniques. The advantages of elbow ultrasound are as follows: it is a dynamic study with good correlation with the location of the pain, it allows comparison with the contralateral elbow, it helps guiding interventional procedures and it is an inexpensive and imaging modality . Milgram described 3 stages fairly of bone lipoma. Stage I: radiographically there is a purely radiolucent zone with expansion of the original cortex; microscopically there are viable lipocytes, interspersed with thin bone trabeculae . Stage II: the radiological aspect may be the same, but there are often localized calcifications; histologically, there is a mixed pattern of viable andnecrotic lipocytes besides central calcification and ossification. Stage III: radiographically there is considerable ossification around the calcified fat of the outer rim of the lesion; histologically there is complete fat necrosis. However, few authors do not differentiate stage II/III. Intraosseous lipoma was considered as a rare neoplasm but with the availability of newer imaging technique, many benign lesions are found. Although, CT and MRI diagnose them accurately but ultrasound characteristics are also conclusive for extra osseous component. This case highlights the importance of HRUS for evaluation of musculoskeletal tumors and any secondary changes in a readily available cost effective dynamic modality and thus guide for treatment planning accordingly. 1. Leonardo R, Chui-Mei Tiu, See-Ying Chiou, et al. Intraosseous Lipoma of the ProximalRadius with Extraosseous Extension:A Case Report. J Med Ultrasound 2003;11:156–9. 2. Campbell RS, Grainger AJ, Mangham DC, et al. Intraosseous lipoma: report of 35 new cases and a review of the literature. Skeletal Radiol 2003;32:209–22. 3. Ahmet kapukaya, mehmet subasi, nevzat dabak, emin ozkul. Osseous lipoma : eleven new cases and review of the literature Acta Orthop. Belg. 2006, 72, 603-614. 4. Onguru O, Pabuccu Y, Celasun B. Intraosseous lipoma of the fibula. Clin Imaging 2002;26:55–7. 5. Palczewski P, Świątkowski J, Gołębiowski M, et al. Intraosseous lipomas: A report of six cases and a review of literature.Pol J Radiol 2011;76(4): 52-59. 6. Radl R, Leithner A, Machacek F, et al. Intraosseous lipoma: retrospective analysis of 29 patients. 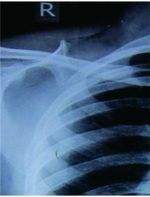 International Orthopaedics (SICOT) (2004);28: 374–378. 7. Jebson PJ, Schock EJ, Biermann JS. Intraosseous lipoma of the proximal radius with extraosseous extension and a secondary posterior interosseous nerve palsy. Am J Orthop(belle Mead NJ) 2002;31(7):413-6. 8. Levin MF, Vellet AD, Munk PL, et al. Intraosseous lipoma of the distal femur: MRI appearance. Skeletal Radiol 1996;25:82–4. 9. Cha et al. Posterior Interosseous Nerve Compression. www.ePlasty.com, Interesting Case, January 31, 2014. 10. Martinoli C, Bianchi S, Giovagnorio F, et al. Ultrasound of the elbow. Skeletal Radiol 2001;30:605-614. 11. Milgram JW. Intraosseous lipomas. A clinicopathologic study of 66 cases. Clin Orthop 198;231:277–302.